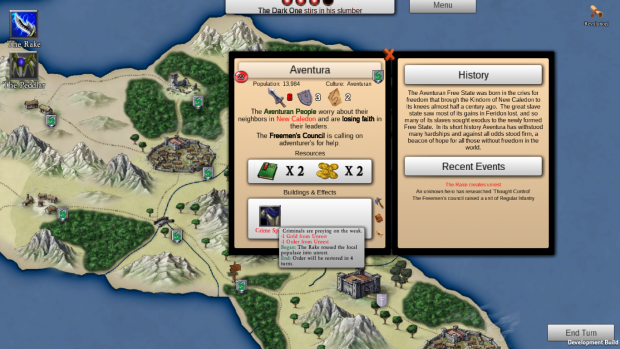 The road to Kickstarter continues, and we're going to break down some of our menus on Screenshot Saturday. That Which Sleeps is picking up some steam! Glad to see we aren't the only people that want to see what it's like on the shadowy side of things. We've received a lot of questions about how exactly the game plays, so we're moving up our schedule on revealing gameplay details. This week we'll be discussing menus, the role they play in the game and our design decisions towards them. The map is separated into "Points of Interest", which allows us to ensure that every possible point on the map is something with history, character, and relevance - unlike in a hex or tile based movement system. This way the player is focused on fewer, but more important, tactical decisions. We attempted to show as much relevant detail in as small a space as possible, which we partly were able to accomplish by using tool-tips to display information and modifiers as needed. Let's break down the menu above and see what a basic POI offers. Name of the POI, and underneath it any region it may belong to - as this particular village is in a Feudal Monarchy, it has a Barony. Most POIs will not have anything for that entry. To the right of that a shield indicating ownership of the POI, if you click on the shield you'll be brought to the Nation screen for that power. If the shield is cracked or darkened, it signals someone taking over the region or it falling into corruption. To the left is the Importance of the POI, as judged by the ruler of the nation that controls it. Importance adds its values to any plots or schemes your agents are involved in, which determines who, if anyone, comes to stop you. Underneath we have population, which breaks down into classes such as Aristocrats and Slaves, and Culture, which also shows any other non-majority cultures present. If the color of these is anything other than default black, it signals a potential crisis. Slave revolts! The three big icons are the most important numbers for the player, they signify, in order - Order, Fortifications, and Danger. Order directly reduces your ability to infiltrate or terrorize through plots a POI, Fortifications aids in defending against armies, and Danger is how much trouble an adventurer or hero may get into while meddling here. The next two big text blocks tell you the general mood of the POI, and what, if anything, it is currently up to. You will get better information if you have "Infiltrated" the POI, notice the Eye marker on the map screen underneath the village, which indicates you have infiltrated this POI. Cities are the heart and soul of the human nations, and are difficult but rewarding to infiltrate. 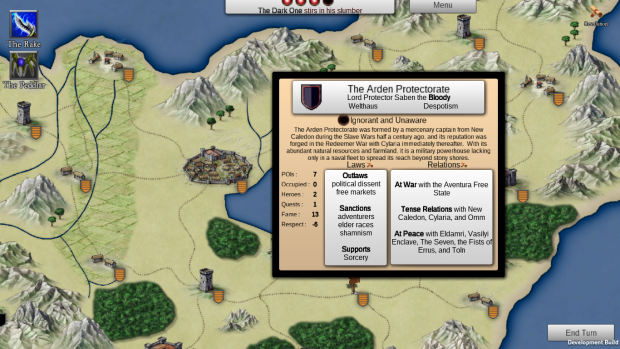 In addition to the resources they offer adventurers and their parent nation, they act as political centers where diplomatic meetings are held and great quests often begin. Let's step through some of the features displayed in this screenshot. 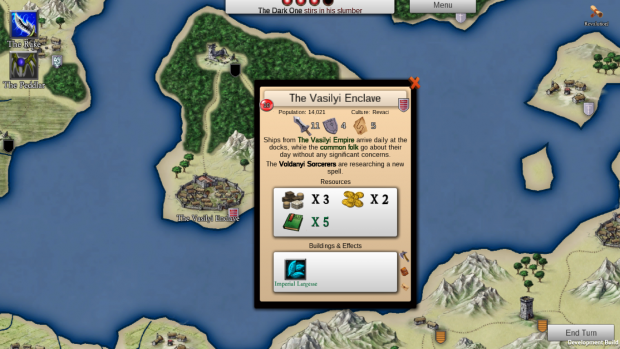 The Vasilyi Enclave itself is a fascinating location in the North Burns, it is the enclave of a powerful off-map empire which by itself is weak, but can call in armies and navies of its mother nation if threatened.... or manipulated... to do so. The first resource shown is Trade. Trade accumulates in the city and can be exchanged for any of the other resources, or to raise relations between two powers or cultures. The downside to trade is if trade is available but not being utilized, it lowers Order. Gold pays for troops, adventurers, and great works and projects. In sufficient quantities it can hire mercenary armies or sway nations to your cause. Lore is dangerous, it allows adventurers to learn new spells, develop new techniques, but more importantly it helps them decode the clues you leave behind. Of course, Lore is useful to your side as well, both in discovering your own spells and rituals and in deceiving those who are researching your return. The "Buildings and Effects" section is used to highlight anything that is modifying the POI, you can see "Imperial Largesse" which grants +1 lore to the Enclave, note also that the Lore multiplier is green. If you were to mouseover it you would see the relevant Modifier, noted as "Arcane." Modifiers of the same type do NOT stack, which is an important tactical note. We've reviewed the majority of POI features, but in the picture above you can see the Background pane, which is the scroll in the lower right of the standard pane. Storage and Consumption shows how much food, lumber, and ore the city is consuming and how much is stockpiled. Always fun to light a giant storehouse of lumber on fire. Recruitment - see what units this POI is capable of recruiting. Knowing what enemies you can expect to fight is key to winning a Military victory. Take a look at the tool-tip over the Effects screen, it lists the type of effect, when it started, and when it will end. The icon itself is important, various effects can be handled different ways. For instance, if the effect is caused by a person, and the icon shows a person, you can assassinate that individual through the infiltration challenge if you have the relevant skill. 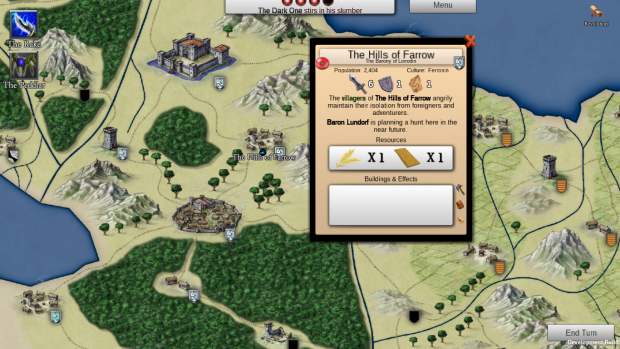 Strategy games live or die on the quality of their menus, and we've attempted to keep things simple but informative. In the nation screen you can see, at a glance, what culture and government type the nation has, what laws are in effect, and its relations with other nations. These are the cornerstones to the diplomatic game of That Which Sleeps and we wanted to remain focused on it. You'll also see "Ignorant and Unaware" which signifies how much, if any, awareness this nation has of your impending arrival and their impending doom.Note that clicking on the name of the ruler will bring you to the ruler screen, which shows the psychological profile of the ruler and your current influence with him. We have received a LOT of questions about "how does the game actually play", so we wanted to tease the Agent Screen a bit. Agent's appear on the map, next to the cities they are currently occupying. They have several skills, a unique scheme, and abilities that allow them to Infiltrate, Terrorize, and perform other insidious acts on POIs. These actions take time, and while they are performing them they generate Threat based on their fame, the action they are committing, and the importance of the POI - get enough threat and heroes may come after you, even more and king's will send their champions to put you down. Alright, let's go through the menu a bit to discuss what exactly we're looking at. Name, health, and profile. Name and health are fairly self-explanatory, but profile is your agents fame, which builds up with each successful action - added to the profile of his minions. Walking around with giants may be fun but it really makes you easy to hunt down. Agents have six skills - Strength, Defense, Infiltrate, Arcana, Command, Labor. Strength and Defense are used in combat against heroes, but Strength also is used when Terrorizing villages. Infiltrate is your bread and butter, and will let you do a variety of actions in almost any POI. Arcana lets you use rituals but also augment your other actions. Command determines how many minions you can control as well as your skill in army based combat. Labor is used for building and excavating, usually ruins. Each agent has a unique scheme, that requires some infusion from the Old One to activate. 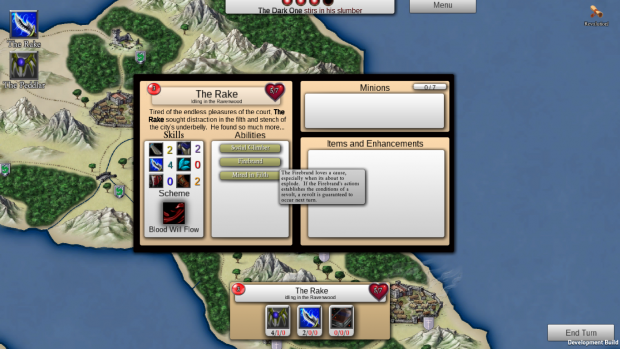 The Rake, for instance, has "Blood Will Flow" in which he commits senseless atrocities in a city, generating very difficult to solve clues with high threat - essentially acting as a distraction while you perform more important actions elsewhere. Abilities can allow you access to different options in challenges, augment your combat abilities, or grant various bonuses. Agents start with a few, but can gain others through minions, experience, or dark infusions from the Old One. That's all for screenshots - we are actively working on the Naval System for That Which Sleeps and hopefully I'll be getting it out to testers this weekend. If we hit that mark we feel like we're still in good shape to move to Kickstarter next month. Be a pal and tell a friend, we need the inertia! Better yet, sign up for our mailing list below.